In the late 1980's there was a series of articles in the English press in Tokyo recounting the exploits of Max Danger, an Expat in Tokyo. Two books eventually came from them and looking at Amazon today you can still order them in time for Christmas if you're quick. The stories are short and hysterical, walking through all the things that make life quite what it is in Japan. To an extent the anecdotes are even funnier if you've lived here and experienced some of the challenges themselves. These days there are many ways for expats to network from the formal ACCJ events to the more casual Brits at Lunch or even the Kobe Curry Club (not sure this still exists). But expat networking globally has come a long way since the dark and internet free days of 1980's and 1990's. There's a whole plethora of expat support groups with excellent advice that makes life simpler and more enjoyable. 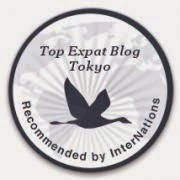 And recently one of them contacted me to say how much they enjoyed reading my blog and recommended me on their site. One of the largest and most comprehensive expat sites on the web, InterNations has a global footprint and some 1.4m members and country ambassadors to help life along. And of the contact I've had so far, they're also very nice people. Thank you for the recognition.